Phainopepla nitens Swainson, 1838. This species is often considered a distinct family. French: Phenopeple luisant; German: Trauerseidenschnapper; Spanish: Papamoscas Sedoso. 6.3-9.4 in (16-24 cm) Sleek, long-tailed, crested birds with rounded wings. Adult male has a short black bill and ragged crest, glossy black with white patches on wings (white not visible when perching). Female is ashy-gray with whitish edges on all wing feathers. 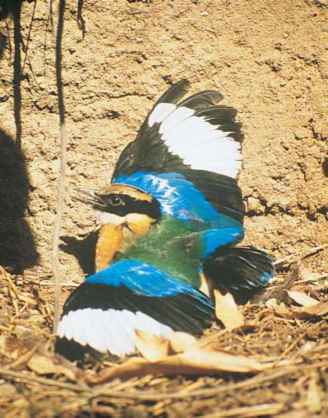 Juvenile resembles female, gradually acquires black feathers throughout first year. Arid scrub-land and open woodland within reach of water courses. Believed to breed in lowland deserts and then move to higher, moister habitats. Somewhat social, nests in loose colonies and forms small flocks in non-breeding season. Territory size varies with food abundance. Call a soft-rising whistle hoi; song a mellow, gurgled warble, series of short phrases with long pauses between krrtii-ilwa. Also mimics other species. Diet mainly fruit and berries, some insects often caught on the wing. 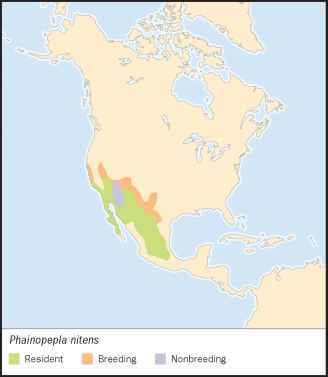 Phainopepla is closely associated with mistletoe, a parasitic plant that grows on many desert trees especially mesquite (Prosopis spp.). Phainopeplas have a specialized digestive system for consuming mistletoe berries. In the gizzard they remove the seed and pulp from the seed coat of the berries; they then digest the pulp and defecate the seeds and seed coat separately, usually on the branch of the tree where the bird was perched. The seeds sprout in the tree, continuing their parasitic lifestyle, having been dispersed by the bird. Monogamous, with large breeding territories. Breeding pairs form loose colonies where food sources are concentrated. In a courtship display a male flies as high as 300 ft (90 m) over his territory, chasing the female while making circles and erratic zig-zag patterns. Two to three grayish blue, mottled eggs laid in cup-shaped nest of plant matter, spider webs, and hair; nest built in central fork of a tree. Both parents incubate 14-16 days; young hatch naked and helpless. Fledge at 18-25 days. Phainopeplas can product two to three broods per year. Not threatened. Breeding Bird Survey data suggest population levels have been stable since the 1960s, however, reliance on mesquite and mistletoe makes the phainopepla vulnerable to habitat loss.